Black Jocks is a monthly Indigenous radio almanac produced in Cairns by QRAM. The journal is an aide for broadcasters and provides a daily insight into Australia’s past history of Aboriginal and Torres Strait Islander events. 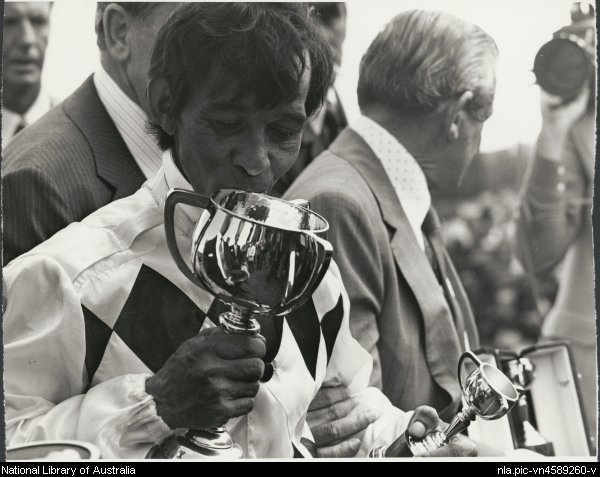 It helps broadcasters with ideas for programs and interviews; for example, the November Black Jocks will features an article on the legendary Jockey Frank Reys, winner of the 1973 Melbourne Cup on Gala Supreme. When all the country is talking about the Cup, Black Star stations will be able to share some of the Aboriginal history of the great event. Originally produced for the Black Star Wide Area Network (WAN) of 11 Stations, it is now being used widely by Indigenous radio stations, including CAAMA in Central Australia, Kool and Deadly in Melbourne and 4RR in Charleville. The idea for a Black Jocks came from the mainstream radio industry publication Jocks Journal, which for a long time has helped mainstream radio presenters with ideas for content, for example ‘Born on this day …’ and to be ready for significant dates and events coming up. As you can imagine, not many of those dates related to Aboriginal and Torres Strait Islander history or heroes. Black Jocks is and is more a day to day almanac of indigenous events for Indigenous broadcasters on Indigenous and remote stations across the country. If your station would like to use Black Jocks, all you need to do is contact QRAM for permission – contact details here. And click on the Black Jocks menu above and select the drop down for the month you are in.